In the last part of this Exchange 2016 migration series we looked at installing the first Exchange 2016 Mailbox server into the Not Real University organization. Now it's time to configure the client access services for the new server. Not Real University is using the same client access namespaces for Exchange 2016 as the existing Exchange 2010 and 2013 servers, so there are already DNS records in place. If you are deploying Exchange 2016 into a different site with new namespaces, you should add the DNS records for the namespaces first. The Exchange 2016 client access namespace configuration can be performed using the Exchange Admin Center, but that's the slow way of doing it. Instead, let's use a PowerShell script that is built for this purpose, called ConfigureExchangeURLs.ps1. You can download it from the TechNet Gallery. 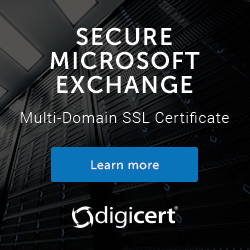 After the SSL certificate has been installed and enabled, restart IIS on the server for all of the recent changes to take effect. In the next part of this series, we'll look at configuring mailbox databases. Do you have any tutorials on cutting over client access services from Exchange 2010 to Exchange 2016? I follow you on Twitter (great stuff btw), and use this site pretty religiously for all things Exchange in my lab. I’m eager to see the tutorial the gentleman previously has asked about as well. I’m currently working on upgrading from 2010 (build 14.3.123.4) to 2016 for a customer of mine. As always, thank you for the great stuff you put on here and Twitter. Even looking after info requested by earlier gents above. Don’t you have any consideration on migrating POP/IMAP from 2010 to 2016? Is enabling and apply same configuration on new servers, enough? Should the service be configure and enable on all new servers? Yes, just make sure the servers are started and the config is the same, and then update the pop/imap DNS records to cutover clients. It’s pretty straightforward for pop/imap. Paul, how about the preferred authentication settings on the VDs? Currently I am using Exchange 2010 with ADFS (Server 2012 R2). I’m facing a big problem with my Exchange migration from 2010 to 2016. My Exchange 2010 environment has 2 Exchange Servers (installed on Windows Server2008 R2) and 2 DB Servers with CAS Array and DAG. One exchange Server and DB Server is hosted on one Datacenter and the others on another datacenter. I installed 2 new Exchange 2016 Servers (Ex16db1, Ex16db2). I migrate one test mailbox from Exchange 2010 to Exchange 2016 but i can open it with Outlook 2010. Please assist me with this migration.